﻿ Juania Australis - A first ever - and it's a girl! Garden & Plants / Juania Australis - A first ever - and it's a girl! Some of you will remember the scientific gardener David Robinson and his garden at Earlscliffe, Baily, Co. Dublin. A trip to Earlscliffe was to visit a living experiment from the weed control using Simazine to the tender, woody plants, carefully planted but from then on left to their own devices. David passed away in 2004 and much can be learned of his achievements, his methods and garden at www.earlscliffe.com. Following a visit to the Royal Horticultural Society's garden, Rosemoor, in 1995, David returned to Earlscliffe and planted a young plant of Juania australis he had received as a gift. This was the first time the species was grown as an outdoor specimen on· our island. Juania australis, the Chonta palm, is an island endemic from Robinson Crusoe Island or Más a Tierra of the Juan Fernández Islands off the coast of Chile in the South Pacific Ocean, where it grows in montane hardwood and tree-fern forests. Against all expectations, the Earlscliffe plant thrived in its new home and was undamaged by the severe winters of 2010 and 2011. In June 2017 it produced its first inflorescence and can now be identified as a female of the species. A more comprehensive account of the species and its Irish connection will be published in Palms, the journal of the International Palm Society in early 2018. This specimen at Earlscliffe caused wonder and envy but also encouraged others to attempt to cultivate it. In Ireland plants now grow at Kells Bay House, Co. Kerry, a private garden in Greystones and at the National Botanic Gardens, Kilmacurragh, both in Co. Wicklow. Kells Bay also offers young plants for sale. 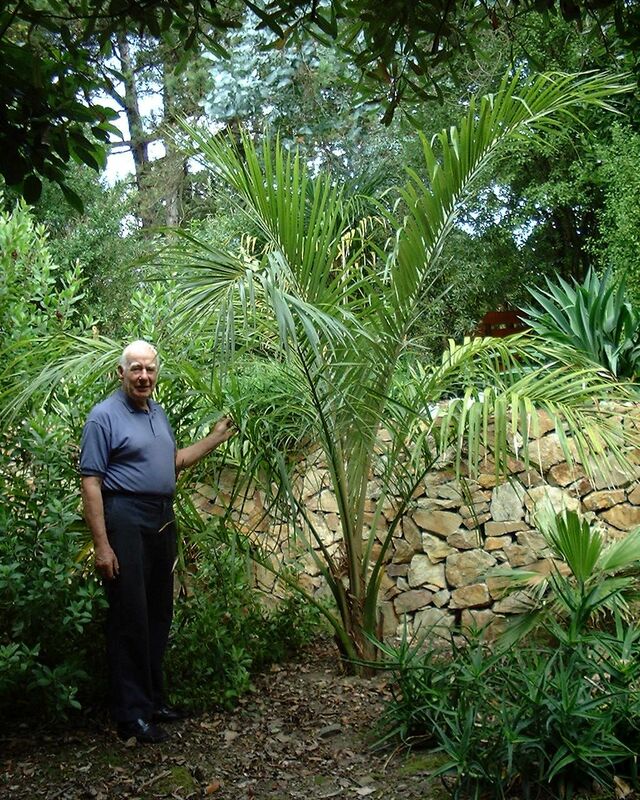 The proprietor, Billy Alexander has sold plants to gardeners in Ireland, Britain and France. Plants at Kells Bay were badly affected during the severe winters of 2010 and 2011 but have all recovered and the Greystones specimen was unaffected. Thanks and appreciations to David's daughter Karen and David Foley for allowing us to share in this first flowering of Juania australis in Ireland.